Massive headache for Paul Cook - and Wigan Athletic boss couldn’t be happier! Wigan Athletic boss Paul Cook has reported a virtual clean bill of health for Wednesday night’s visit of Stoke - and welcomes the selection headache that will involve! Only Danny Fox, who was knocked out at Rotherham last Saturday before being stretchered off, is not fit for selection due to concussion protocol. Skipper Sam Morsy returns from a two-game ban, Lee Evans has recovered from illness while Nick Powell - who was due to be a sub at Rotherham only for his partner to go into labour after the team sheets had been handed in - will be involved for the first time since November 28. Antonee Robinson and Gavin Massey are also back from injury, and the Latics chief can’t believe his luck after seeing his squad stretched to breaking point this term. “I’ve got selection problems now, which I haven’t really had for most of the season,” Cook acknowledged. “As everyone knows, competition for places is key. “There’s been times this season, in too many positions, lads have just been getting picked week in, week out. “We’ve had a very tough run of injuries, going back to when we last played Stoke (in August). Cook is particularly delighted at the return of Powell, who has finally recovered from hamstring and calf problems that have dogged his season. “It’s great for Nick, it’s great for everyone,” he enthused. “It’s been 11 weeks since we’ve had Nick available to play. “There’s not many teams in the Championship who could do without Nick Powell for 11 weeks, let alone Wigan Athletic. After picking up four points from their last two matches, against QPR and Rotherham, Latics can take another huge step towards securing their Championship status with another positive result. The manager, though, refuses to put any kind of targets in front of his men, aside from winning the next game. 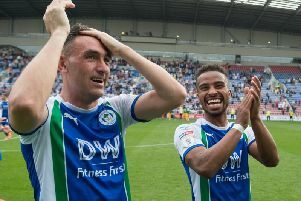 “There is an amount of points out there that would make everyone connected with Wigan Athletic smile. “For me as a manager, I’ve never been one to set targets. “Once you start setting targets, if you get there, it allows you to lose games, and still be on track.